"In two months, David Cameron has risen almost from nowhere to assume an apparently unassailable lead in the Tory leadership race. Yet in this short time he has been tested formidably. In maintaining what might be called an honest discretion about his past use of drugs, in resisting the often heavy pressure to come out with details of the next election manifesto four years before it is due, and simply in keeping up his enthusiasm over a gruelling campaign, Mr Cameron has shown he has a tenacity which belies his fresh face." "He deserved his early lead, and did not entirely deserve the drubbing he received from the media at Blackpool. He, too, is responsible for the resurgence of Tory fortunes, not least by advocating a clear and coherent set of policy principles based on freedom and enterprise. He would make an excellent senior member of Mr Cameron's team, capable (in his own words) of reaching parts of the country the other cannot, and useful in keeping the young leader on the right side of the centre ground." The Sun also opts for Mr Cameron this morning. It does so after echoing The Telegraph's concern about his policy vagueness. 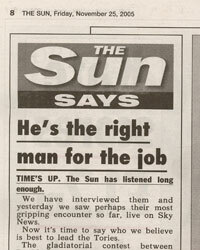 The Sun focuses on tax policy - "Nobody is entirely sure where he stands on issues like taxation". The Telegraph agrees - "Many are concerned, for example, by his formulation on the economy, that he will "share the proceeds of growth between public spending and tax cuts". Mr Cameron should realise that unless a major transfer of resources is made from the unproductive public sector to the productive private sector, by large-scale tax reductions, there will be no "growth" to "share" at all." "He has handled questions about his experience with drugs — and his privileged Eton schooling — with maturity. He looks good on TV and he has the rare gift as a Tory of making voters feel good about life. These may seem superficial qualities. But they are essential in an age when the medium is the message. They have already persuaded many voters he is a match for Tony Blair - and eventually, Gordon Brown. Cameron is bright. He will learn fast. The choice now is between a veteran who, despite genuine qualities, has never really made the premier league — and a raw beginner with a sprinkle of stardust. After eight years in power, Labour is tired and in many ways discredited. Britain desperately needs a real Opposition leader to take them on. We hope David Cameron is the man to do it." That completes a clean sweep of newspaper endorsements for Mr Cameron. But newspapers have not played a leading role in this contest - they have tended to follow the lead of opinion polls and the political editors of BBCtv and ITN. This will be one of the conclusions of this site's definitive review of this leadership contest that will be published on 5th December. The review is based on interviews with insiders from every major campaign team. Like the candidates' answers to the ConservativeHome.com questionnaire, stages of the review will be posted on the hour, throughout that day. If you would like a full copy at the start of that day you should join ConservativeHome's free emailing list. HAVE YOU VOTED IN CONSERVATIVEHOME'S OWN SURVEY OF TORY OPINION? Its a shame that even well paid newspaper people support style over policies, but then most sway in the wind anyway in terms of latest opinion polls than sticking to the hard job of making this country work? Ed- as you say, a clean sweep for DC. But of course, backing DC in our leadership contest is not the same as backing us Tories in the next Election. And today's YouGov poll shows Brown-led Labour would still crush us, even under DC. And most of the media would- as we know- follow the expected winner. Stardust is not enough. We're going to need distinctive appealing policies and the determination to sell them to the electorate. It would be tragic to ape Blairism just as the wheels drop off (I'm sure there's one of those metaphor things in there somewhere). The question is now that the audience can identify the difference between Stork Margarine and Butter; can it tell the difference between David Cameron and Butter ? or must it wait for that melting sensation ? What a disgrace. Following opinion polls and wanting to be seen toback a winner makes me sick. Who on earth is going to vote on the basis of a newspaper endorsement anyway. To say Davis has "never made it into the Premier League" is simply wrong. This is a politician who was a very powerful minister, ran the most powerful select committee and has been the most effective Shadow Cabinet minister for several years. He made one substandard conference speech and the result is this. I hope Davis rejects Camerons offer of a job in the Shadow Cabinet and sits on the backbenches. From the backbenches he can criticise the awful mess Cameron will make of the job. RIP the Tory party. There was a most interesting note written by Liam Fox on Conservatives.com which has since disappeared (I can't find it again after 15 mins searching the site), explaining the changeover from a totemic approach to a more holistic approach to politics. With the EU the totemic would be, for example, such as this - I'm against the EPP so I'm a bigger eurosceptic than him. It has the mentality of someone trapped and powerless making threats. The holistic is different. All that matters is whether the thing under discussion is right or wrong. If it's wrong, sort it - no need to establish credentials and breast beat - or overclaim anything. It's the mentality of someone in powewr taking action. It also showed that the rapprochment between Fox and Cameron is strong. Shame the piece has wandered off. Can anyone find it? It is part of the jigsaw which gives the key to understanding Cameron and Fox's politics. I am disgusted by son much I have read on this website over the last couple of weeks since I caught on it was here. Is this supposed to be a Tory website? Or is it infested with left wingers trying to undermine the Conservative Party? I do wonder. You are so right and it really is a crying shame. Liam Fox joined forces with Cameron because he believes (and is wrong about this) that the gay rumblings (as if we care) were put about by the Davis camp. Please don't think this is anything more than pique. "I hope Davis rejects Camerons offer of a job in the Shadow Cabinet and sits on the backbenches. From the backbenches he can criticise the awful mess Cameron will make of the job. RIP the Tory party." Why would you want that? Davis is a great front bench performer and we would be stronger with him in a prominant position. He has made it clear that he will serve, do you not trust his judgement? Would you prefer to see a Brown government than a Tory one with Davis in a leading position? I can see how you are dissapointed that your man has (almost certainly) lost, but to paint it as some sort of disaster when your candidate has made it clear he does not agree seems a bit over the top? I can see why we were once called the 'stupid Party' and for the first time I can understand the 'nasty party' comment of Theresa May. Some of you writing here clearly dont want the Conservative Party to win again and exemplify why we have lost 3 elections in a row. You get involved in idiotic hair splitting, too concerned about personal agendas and some non-existent ideolical purity. Get real.... The public are not interested in all that rubbish, it leaves them cold. Please remove heads from posteriors, take a deep breath of fresh air and look around outside. See what the rest of the world are saying, take note and behave accordingly. As I see it Cameron is who will restore us to power and who talks to those we had lost. We've had a lot of polling on the two contenders in relation to Labour. I'd be interested to see how Cameron's leadership will reduce Lib Dem support. I can envisage Lib Dem support moving back to a modern, moderate Conservative Party, which will increase Lib Dem frustration with the increasingly hopeless Kennedy and could even lead to the new breed of right leaning Lib Dems, defecting to us. This is a very typical English pessimism. Looking on the brighter side, maybe Cameron will communicate a strong message that could return people to the Conservative party. Possibly, he will spend the next few years working on an approach that could actually explain to people why they should vote Conservative, rather than the message of the last two elections which seemed to consist of saving the pound and immigration. With Cameron, we are dealing with a bit of a gamble. My biggest boubt is that if his team can't be bothered to reply to queries from their web site, it is either incompotence or arrogance. Hopefully, this doubt will be proved wrong. It is interesting how Cameron seems to be getting support while his supporters sound like they have reservations. Just as the YouGov polls showed his supporters think he's a lightweight, these endorsements seem to rue his fuzziness on issues of policy and principle. If he is elected, Cameron had better deliver poll resulys quickly, because a leadership elected on the conviction that a leader can do that, could quickly founder if those hopes were disappointed. re: nicholas boys smith comments on front page. if boys smith speaks for the future of the conservative party then they will never get elected. try reading Lord Gilmour's 'whatever happened to the Conservative Part' for some clues as to where it has gone wrong. as for Cameron Vs Davis, it's a bit like Home Vs Duncan Smith isnt it? If Cameron wins, it would be absurd for David Davis to sulk on the backbenches like Ken Clarke and he would lose a lot of credibility if he did so, as he well knows. It would of course be up to Cameron to offer him a job where his considerable talents can be deployed effectively.....not least in deflecting the shellfire which Labour will target on whoever becomes leader. Good friends as we are, I think you're way out on this one. I agree that DD not being in the premier league is a criticism without foundation, but RIP the Tory party is OTT pessimism, the closest we came to that was in 2003 when we were a national laughing stock and people were waiting for IDS to be chucked out. I think your analysis is wrong, nobody made these doomsday claims when IDS was elected, even though he was never going to make it to no 10. DC has a far better chance of putting this party back to government, and encouraging his rival to undermine him if he wins (as I assume you're doing) shows very little understanding of what caused the 2003 fiasco in the first place. If you lot reflect the party, I'd rather have an optimistic, idealistic party in government than a pessmistic, purely pragmatic one. Not that there is one! Is Barbara Villers for real? Surely that persona is a complete piss-take? Neither Gordon Brown or David Cameroon are leaders of there respective parties yet so its rather unwise I think to take too much notice of polls about how thay would do against one another at the next election which is still four years away, a lifetime in political terms. I have to say I just can`t understand the attitude of Davis supporters. I get the impression from the increasingly hysterical nonsense we are getting from them that they actually would like to see David Cameron be a failure as leader. I have never really understood why there is so much hatred of DC by some on this site but I have started to think that behind it all is not deep political differances but plain old inverted snobbery.Put simply they just don`t like him because his rich! If David Cameron is elected leader it will be the best thing that as happened to the party since it won the 1992 election and I am certain he will go on and beat Gordon Brown or anyone else Labour may put up against him at the next election. Lets start looking forward to and working for victory not hoping for defeat. No Spence I'm not a piss take - are you? John and Babs, please credit your fellow members with more intelligence than to vote against David Davis on the basis of one poor speech. I am voting for David Cameron because he has consistently communicated better and, while clearly being Conservative, he is able to show people outside the party that he understands what matters to them. He has the support of most MPs and, I believe, the best chance of winning the next election. I understand the disappointment that Davis supporters will be feeling - I've felt it at every leadership race since John Major was knifed. I am sorry but I couldn't agree with you less. You are entitled to your opinion. I just don't like the idea of turning into the Lib Dems - and I don't like the way he communicates - a matter of taste, I know but there it is. .Put simply they just don`t like him because his rich! Jack Stone manages to present his case in an incoherent fashion; either he mis-spells everything or simply does not bother to finish sentences. We have a Prime Minister who has no knowledge of verbs, so perhaps Jack is one of the Blairites on the move. Is Cameron rich ? Somehow I think the previous Member for Witney was richer. Simply put Cameron has zero experience and the Conservative Party is taking a big punt on a horse with no form. Maybe he can astound us all, but that is the very least he is obliged to do. As the Americans say, David Cameron is right behind the 8-ball. Turning into Lib Dems? Crikey, what jaundiced perversion. And Rick, you're right, somehow you think.